I try to do a giveaway whenever there's something that needs celebrating, and boy there's stuff to celebrate right now: The Pencilcase Blog turned 3 last month, and our Instagram page passed the 5k followers milestone! That's what I call reason to celebrate, so let's do just that! With the help of my lovely sponsors Appelboom, La Couronne Du Comte, Penworld and Fontoplumo, I planned a series of giveaways in the upcoming weeks, with well over 500 dollars worth of prizes to give away! Sound good? Well let's get to it then! The fourth giveaway is sponsored by La Couronne Du Comte. 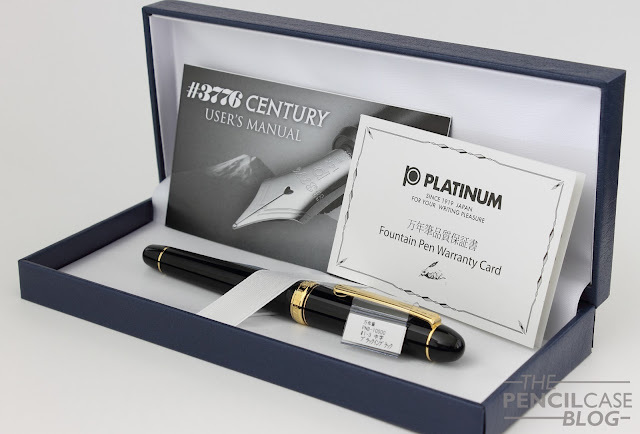 You can win a brand new Platinum #3776 Century foutain pen (medium nib)! WANT TO WIN? ENTER BELOW! EVERY COMPLETED STEP COUNTS AS ONE ENTRY IN THE GIVEAWAY! The giveaway is open worldwide as always, and closes 27/07/2016! The competition starts 19-07-2016 and ends 27-07-2016. Follow the guidelines in the Rafflecopter widget, unvalid entries will be moderated! The winner will be announced after the contest closes. The winner has one week to get in touch after the giveaway closes, failing to do so will result in a new winner being picked. The winner is chosen at random, using random.org. Oh, now this is a nice one... I always wanted to try a Platinum nib! A Platinum 3776 has been on my short list for a while. Thanks for the opportunity! Great pen! I have the 3776 Bourgogne and I love it! This classic black one looks stunning too. Great everyday pen! Thanks for the giveaway! P.S. Thank you and La Couronne du Comte for this kind giveaway! Love the 3776 nibs - one of my favorites! You have a great way of celebrating. Thanks for letting us all join in like this. WOW ! That's what a giveaway should always look like! Platinum makes really nice pens, I'm in. Ever since I bought my first fountain pen - a platinum cool - I knew that I wanted to step it up to a 3776. Several Lamys, Pilots, Twsbis, and other pens later, I still have yet to make the plunge! Such a beautiful pen! Oh my! That black is simply stunning! EXCELLENT writer! Thank you for the opportunity to win. Congratulations! And what a beautiful pen to celebrate the milestones! This is such a beautiful pen! I don't own any Platinum fountain pens yet. I just got a Sailor Pro Gear II Slim and love it! I want to try all the Japanese pens now! Will this be the time I will finally win something? Thank you! That's a really nice pen! It would be lovely to try a Platinum pen! My first fountain pen was a Parker Frontier, and I've been in love with fountain pens ever since! I have yet to add a Platinum to my collection. I hear they are excellent. Oh, now this is nice, always heard wonderful things about Platinum pens. It'd be wonderful to try one out. Love love love 3776s. It would be great to add a Medium nib and this classic body style to my collection. I love Platunum #3776. It's the pen I have the most iterations of - 12 so far, with two more on the way (Kawaguchi and Yamanaka). Looks amazing. Such a great giveaway. Thankful for the giveaway! Platinum is the first brand of my first fountain pen! I think this pen is lovely and a great pen to giveaway! My current favorite pen is a TWSBI ECO....but I do like my Kaweco AL Sport. I have a couple of $1.50 Platinum Reviere PTR-200's with quite acceptable nibs. I would be excited to try a 3776. Thanks for the chance at winning. This is a grail pen! Beautiful pen, I'd love to try it! I'm really enjoying my TWSBI demonstrators right now. I have an ECO that is filled with Graf Von Faber Castell Moss Green & a diamond 580 filled with Diamine Red Dragon and there are times I just can't help but take them out and look at them like lava lamps. Oh -- want!! Thank you! I've been eyeing the Platinum 3776 for months now - but so far it's still sitting outside my budget. Thanks for the giveaway, and the opportunity for someone to win one! La Couronne Du Comte and The Pencilcase Blog thank you for such opportunity :) nice pen! I'd say I love fountain pens because of how ubiquitous they are! You can find them in any country on Earth, and talk about them with people from all generations! This is one heck of a prize! That's a great pen. Thanks so much for the opportunity to win! A beautiful classic pen from one of the best Japanese pen makers! This pen seems to have always been on my to buy list, but it seems to never be at the top. If I win, my other fountain pens may revolt and start burping copious amounts of ink. I'll take the risk. What a nice pen! Thanks for the giveaway, as always. What a cool giveaway. My first pen was a Sheaffer Imperial that a lost at school - my years later someone I was trading with on the internet kindly sent me a similar pen without telling me. It was a lovely surprise! Really nice opportunity. I'm in. This is a beautiful pen. I am looking forward to trying out this nib. Yes, another chance to win. Good luck to all (including me)! Thank you for running these giveaways! I would love to be able try the pen out. I have heard so many good things! Congrats on 3 years and thanks for the chance! Congratulations to your anniversary! Thank you for the chance to win such a wonderful pen. Would be a good step up from my Lamy Safari. Awesome giveaway, congratulations on the anniversary of your blog! Platinum makes the best nibs, in my opinion. Not too soft, not too hard and the ink flow is perfect! I'm a college student and using fountain pens is one way I make my studies enjoyable. I've been slowly building my collection, and the Platinum 3776 is on my list! It would be fantastic to win one - thank you for the opportunity. This pen has been on the wish list for a while now... I'd love to win one! Ohh pleaseee this time I want it, I've been watching this Platinum pens and I am craving for one! I've wanted one of these pens for so long. Thanks for the chance! I would love a Platinum! 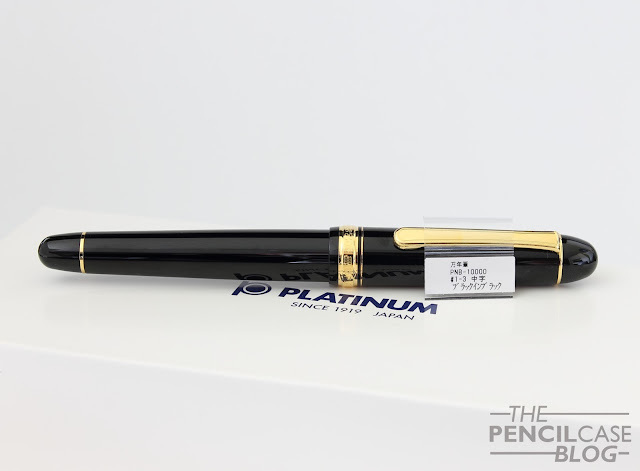 I always wanted to get a Platinum pen, especially this model. It has such a nice classic design and the nib really seems quite big. I'm really interested in how the famous ‘Platinum feedback‘ actually feels. The Platinum 3776 (SF) is one of the best pens I've ever tried, with another one being Sailor Sapporo demonstrator. With top class and interesting nibs, they are something hard to bit. I wish to try 3776 with other nib, F or M, I haven't decided, and also the Yamanaka or red version. One of my favorite pens! This would be my first Platinum! Thanks for the giveaway. This would be a fun addition as all I have now are mostly beginner level pens.